Wat Phra That Doi Suthep is one of the most important Buddhist temples in Chiang Mai, Thailand. According to legend, a monk from the Sukhothai Kingdom dreamed that he would find a relic of the Buddha in Pang Cha. The monk dug at the site he was shown in his dream and found what was believed to be the shoulder bone of Buddha. Said to have mystical powers, the bone was placed on the back of a rare white elephant, which was let loose to wander. The elephant climbed halfway up Doi Suthep Mountain, stopped, trumpeted, and dropped dead. Believing this to be a sign, Doi Suthep was built on the very spot where the elephant perished, and a statue was erected to mark its grave. Over the years, I’ve visited this gorgeous Wat numerous times. Especially after I began wintering in Chiang Mai several years ago, I felt obligated to make the journey up to the mountainside temple whenever friends or family visited me. 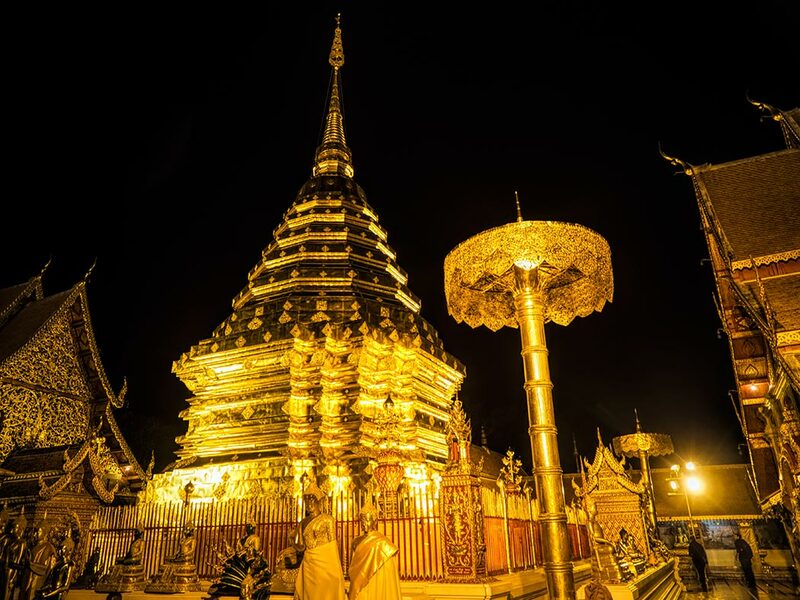 Yet in all those years, I never knew it was possible to visit Doi Suthep at night. In fact, the official Thailand Tourism website still says that the opening hours are 6 a.m. to 5 p.m., every day of the year. Recently however, I learned from a Thai friend that tours were available by night. I booked one for 600 baht (slightly less than $20 USD at the time of this writing) and wasn’t disappointed. By day, the crowds at Doi Suthep are so large that it’s difficult to enjoy the experience, but on the night I visited there were fewer than a dozen people present. The grounds were eerily silent and ethereal, bathed by floodlights that illuminated the famous gilded Chedi and Royal umbrellas. My only disappointment was that we had too little time to soak up the serene atmosphere. Hi Lesley: Thank you SO much for your comment. I have to tell you, it made my day. I earn very little money through this blog. While others have chosen to clutter their blogs with sponsored (paid) articles and/or advertising, I have kept my content free to read with no distracting garbage content or distracting ads. This is a labor of love for me. I do it because I really believe the more we travel, the better the world will be. I always say the better we know one another, the less likely we will want to kill each other. But it can sometimes be discouraging. I wonder sometimes if I’m making a difference or having any kind of impact at all. And then I receive a comment like yours. Bless you! Beautiful. You are blessed that you can travel to these wonderful places. Hi Peggy: Thanks so much. I am very aware how fortunate I am to be able to travel like I do. And very grateful.